Have been, and always will be!! It had been a while since I took such a long holiday. A 15-day vacation where I just got away from everything, even my laptop.. Not to mention, that I even locked up my work laptop in office itself! Post-Vacation I realised that I couldn't actually have gotten more Marwari :) Here's a glimpse.. I started my vacation by going to Rajasthan. I met my parents and cousin at the Delhi airport directly and we drove to Bikaner, followed by Jodhpur, Jaisalmer, Udaipur, Jaipur and Agra. I must stop here to tell you that the tour was for 10 days, so we surely made full each and every rupee and minute count. 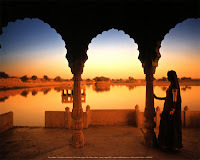 The beautiful aspect about Rajasthan was that each place was so distinctively different from the other, although they all sport the mystifying havelis, forts, intricate architecture, magnanimous structures. For example, Jaisalmer has vast stretches of desert, Udaipur is hilly and full of lakes and Jaipur is an urban commercial city. I always wondered why everyone said that it is impossible to cover the entire state in one go, which is true, although we did manage to cover atleast half the hotspots there in a record time. The grandeur, (past) wealth, golden sands, and camels were just what we expected, and what we got in return. Most of India has a cultural and historical past, but this western state has managed to sustain, restore and revive them beautifully even in this day and age. An interesting fact is that 60% of Rajasthan's income is generated solely through tourism, and the most prominent tourist communities are a) French and b) Bengalis (Yes, Here too!). Our last destination, was Agra where I saw my First Wonder of the World, the Taj Mahal; History narrates Shah Jahan's wish to replicate the Taj Mahal in black too.. I probably would have liked to see both. Then we flew to Kolkata, the second home of Marwaris. Personally, I think Kolkata Marwaris are going to form their own sect as they are so characteristic, different - the right word being unique - you have to be one to know what I am talking about ;). So then started Diwali celebrations filled with lights, pujas, crackers and little lesser noise - over the years the Kolkata police has realised what a ruckus we can create and have been proactive in implementing strict guidelines for bursting crackers. My entire Kolkata trip was spent in different festivities and occasions meeting the same people over and over again with difference in venue, perhaps to gauge where the best combination of bonding occurred (if any). It was filled with laughter, surprises, tiffs which was coupled with rich fatty food and sweets. The most fun part every year in Kolkata is the "cousin" gathering sessions where there is a deja vu effect, a pattern of over-planning, plans spilling over, someone missing, eating way past midnight, talking about our lives (even though most of us are on BBM) and sleepovers. As I landed in Bangalore, I realised how much I enjoyed being a Marwari over the past few days and was glad that this cosmoplitan city would gear me up towards becoming a cosmopolitan again!